Ramps, wild onions, wild garlic. These are some of our best wild foods come springtime. More than 100 species of wild alliums call North America home — allium being the genus covering both onions and garlic — but it is the Eastern ramp, Allium tricoccum, that has been all the rage among chefs in recent years. They’ve become so popular I even see chefs here in California using them with abandon; no native ramp grows within 2,000 miles of San Francisco or Los Angeles. Locavore issues aside, perhaps the trendiest thing about ramps right now is to bemoan their overharvest. Is this happening? Certainly, in some places. I’ve seen some startling before and after photos. But most professional foragers I know harvest the same patches of ramps every year — and some of these folks have been picking for 30+ years. They know, as well as any good farmer, that you don’t eat your seed corn. The sustainability of any bulb, corm, root or rhizome harvest all hinges on how you pick the plant. First and foremost, you must find your onions. 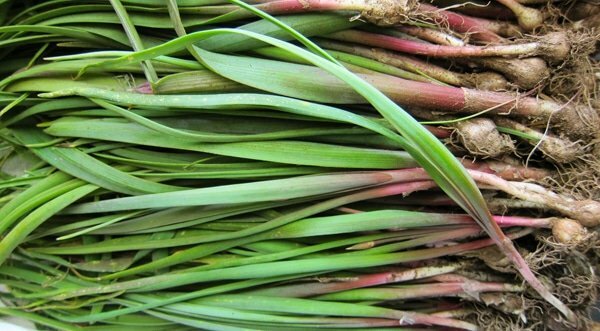 Ramps are showy onions with large, wide leaves. 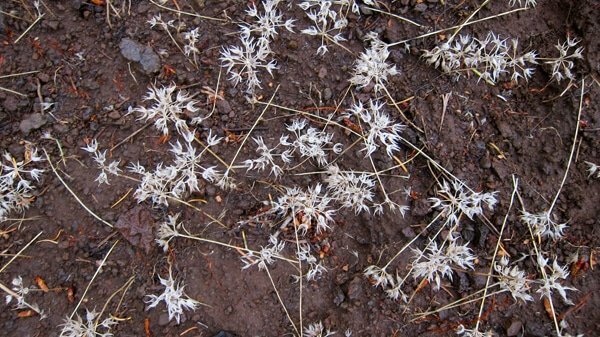 They’re pretty easy to spot, especially in Eastern woodlands, where they can literally carpet the forest floor for acres. Most wild onions are not so easily located, although one, the invasive three-cornered leek of California and Oregon, A. triquetrum, is almost as gaudy as the ramp. 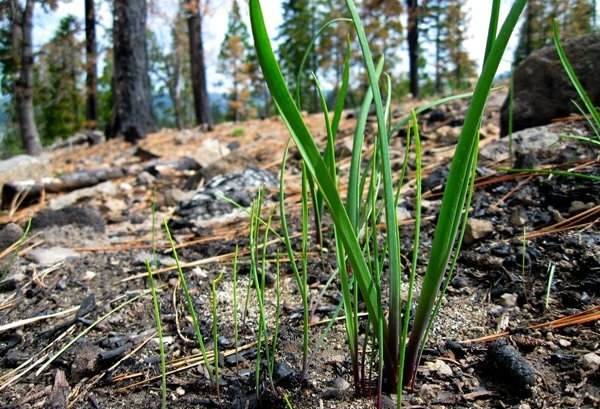 There’s an onion for pretty much every environment, from deserts to forests to streamsides to lawns to high above the treeline in Alpine meadows. 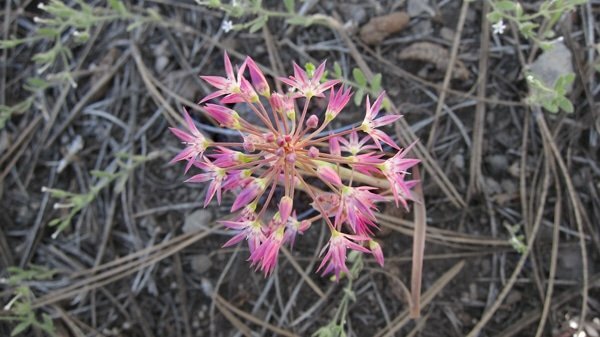 My favorite is the dusky onion, A. campanulatum, which is common in the mountains from California to British Columbia. Onions, being bulb plants, send up grasslike shoots first. This can be as early as January in the Bay Area for the three-cornered leek, to mid-July for Alpine onions. Onions, in general, like to live in large troops: It’s weird to find just one onion. A great many onions have a rosy blush to the base of their stems. But not all. Your nose is your best tool when trying to figure out if that grassy shoot you are looking at is an onion. Anything that looks like an onion that also smells like an onion is an onion. Lots of bulbs, some of them poisonous, can look like an onion, but none will also smell like one, too. Pick only the largest individuals. See the photo above? There are a dozen little onions in that image, and only the largest one is worth picking. Stick and move. Pick that large one and move on. Look for another large one. By doing this, you will scatter your picking activity and leave the patch thinned, without large holes in it. Take only 10 to 20 percent of any given patch. And that 20 percent number is only really for private ground or ground you have a very good idea that no one else knows about. Think about it: If I collect 10 percent of an onion patch, then you come along and take 10 percent, then two other people come… well, we’ve screwed that patch, haven’t we? 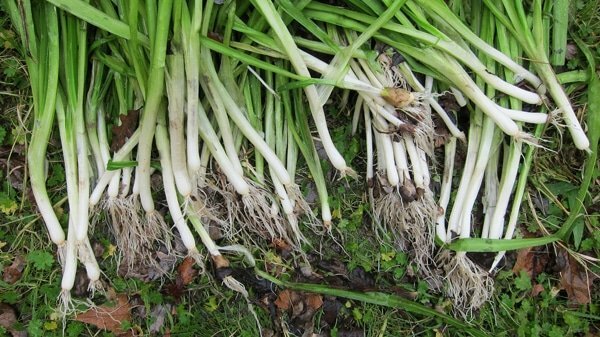 If you really need some wild onions, but the patch is pretty small, pick one large green leaf from each plant. That’s what I do with my Chinese garlic chives at home and they never appear to really notice it. It’s a good way to get that flavor you crave without digging up the whole plant. Speaking of digging, know that the bulbs on most wild onions are very small. Do you really need that bulb? It’s a fair question. I dig my onions, and I do take bulbs, but not always. Most of the plant is above ground, so picking off the tops gives you a lot of onion while leaving the bulb. 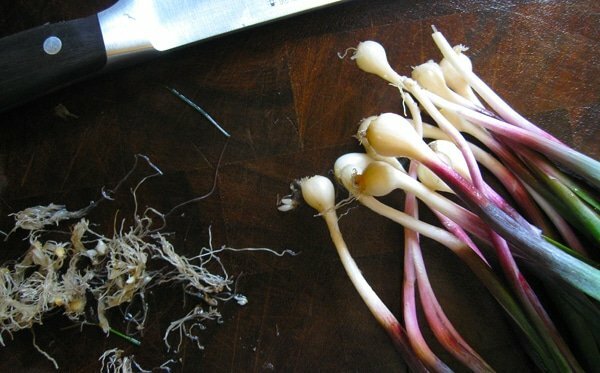 My colleague Russ Cohen in Massachusetts harvests his ramps this way. But, I like to pickle the little bulbs, or feature them in dishes, so I dig. Ramps and nodding onions, A. cernuum — which live in almost every state but California — do have decent-sized bulbs. When you unearth the bulb of most wild onions, you will see it surrounded by many tiny little bulblets. It’s very important to replant all those bulblets and any small onions you may have disturbed while digging the big one. This actually can help the onion patch because those bulblets stay small and dormant while the large onion is in place. Removing it opens up space for the rest of the onions to grow; this is true for any bulb or corm plant, like camas. Many onions also have a cool trick they can play with their roots. Their roots are attached to the bulb with something like a breakaway: You can snap off the whole root cluster, leaving the bulb clean. The cool part? You can replant that root cluster and it will grow a new onion. Try this with a store-bought leek sometime. It’s trippy. This onion’s not ready to dig yet, because the flowers are just blooming.These Idaho onions, however, are in perfect shape to dig. Keep your onions cool and as you collect, and point them in the same direction; this keeps the amount of dirt in the foliage to a minimum. When you get home, clean the onions in a basin of cool water by gently rubbing them down to remove old, dry skin. Once cleaned, wrap in a damp paper towel and put them in a covered container or plastic bag in the refrigerator. Stored this way, the onions will keep for about a week to 10 days before they deteriorate. Elisha: No, it’s not. Maybe you have a feral garden onion? Or maybe it’s not an onion at all? Take a good quality, artisanal apple cider vinegar (like what you can easily make at home), and infuse wild onions, ramps, or garlic in it for at least a couple of weeks, preferably longer. Both the alliums and the vinegar will be AMAZING!